Active sponsorships for high profile clubs. Players from Kenya are accepted! 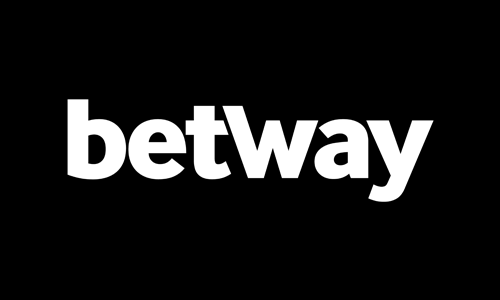 Betway Kenya is an international brand which is also widely popular in Africa. They are main sponsors of several football teams in Europe, including one of the most traditional team in the Premier League: West Ham United. The company is fully licensed and has been operating in Kenya since 2015. With a low minimum bet requirement and a larger than average payout possible, you can win a lot of money even if you bet small. As an online betting site, they offer top of the line security for their customers. Depositing money is easy and payouts are fast too. The only downside is that you are charged a percentage each time you make a deposit. The Customer Service department is available between the hours of 7 am and 2 am by calling a toll-free number. You can contact them 24/7 and 365 days a year via e-mail, live chat and WhatsApp. If all else fails, you can find them on Facebook and Twitter. Throughout the year, all customers can take advantage of various promotions and a Betway Kenya Loyalty Club which rewards those who keep coming back to make more bets. Each time you wager, you accrue points which you can then collect at the end of every week as a FREE Bet. The bigger the bet, the more points you will get. Football is the most popular sports for online betting in Kenya and Betway Kenya boasts the widest range of local and international leagues, and national team competitions. The sportsbook page is easy to navigate with all the sports (under 30 different ones) displayed in the middle of the screen ready for you to choose. The Live Betting page is very well designed and easy to use with more than a 1,000 daily events. Live scores and live statistics are readily available coupled with a live ball tracker. All the markets are displayed below the live score. The odds change through the event so you can choose which bet you want to wager one all the way until the final whistle. Betway Kenya Kenya also has dedicated pages for betting on Virtual Sports and playing Casino games, slots and jackpots. 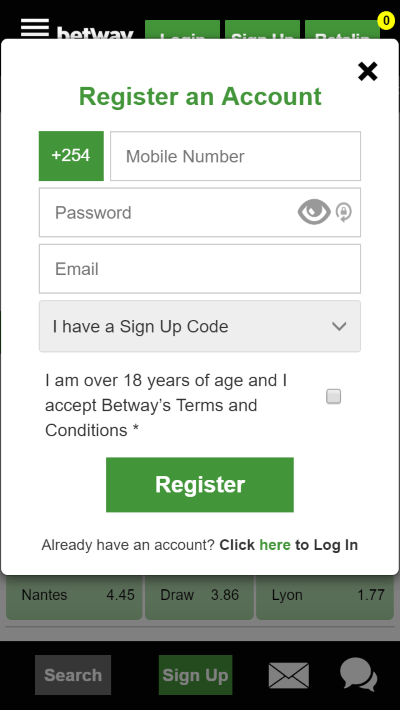 If you want to join Betway Kenya, registering with the site is easy, but you must be at least 18 years old and a resident of Kenya. Click on the “Sign Up” link on the site and fill out a simple form. All you need to start with is a mobile phone number. Please make sure that your phone number is connected to your Mobile Money account which you will use to deposit and withdraw cash. Input your e-mail address and password and click on the “Register” button. Once all your details have been verified, you will receive an introductory e-mail with a login link. You can either login from there or go to the page directly and click on the “Login” link which is right next to the “Sign Up” button. Input your login details and you are in. We advise you to bookmark the home page so you can get to it easier next time. Betway Kenya offers you four different Jackpot games which could deliver staggering payouts. And there are two different bet types you can choose: Match Result or Correct score. There is a weekly draw. If there are no winners, the cash pot rolls over into the next week. 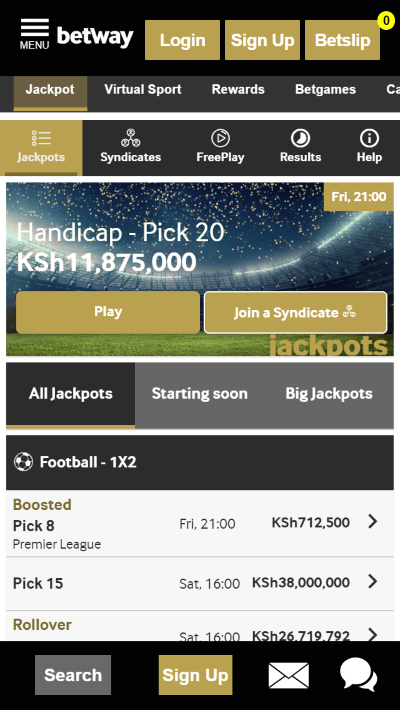 The most popular jackpot in Kenya is the Pick 13 jackpot where you must predict 13 correct Match Results to win millions, and sometimes tens of millions in KSH. The Pick 15 jackpot gives you a list of fifteen pre-selected events for you to predict. You can win big if you get them right. Guess six Correct Scores for the nominated fixtures in the Pick 6 jackpot. What’s good here is that you can win bonus prizes even if you get half of the scores wrong. One of the biggest jackpots in Africa is the Colossus Jackpot which right now has over 200 million KSH in the pot. To win, you need to guess Correct Scores for seven pre-selected games. Even if you get three out of seven wrong, you can still win a sizeable consolation prize. You can either join the Jackpot competitions on your own or you can join a syndicate. Details on how to do that are on the website. These days it’s betting on the go that is trending, whether through smartphones or tablets. 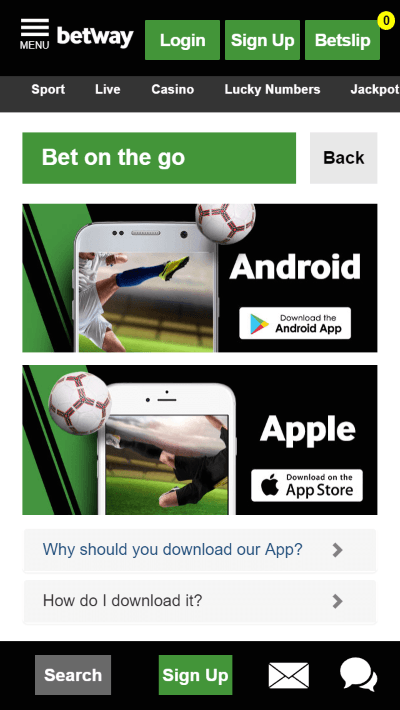 To stay current, Betway Kenya has created a great app for their customers. It’s available for both iOS and Android platforms. To use the app, first download it from your iTunes store if you are an iPhone or iPad user and then simply log in. 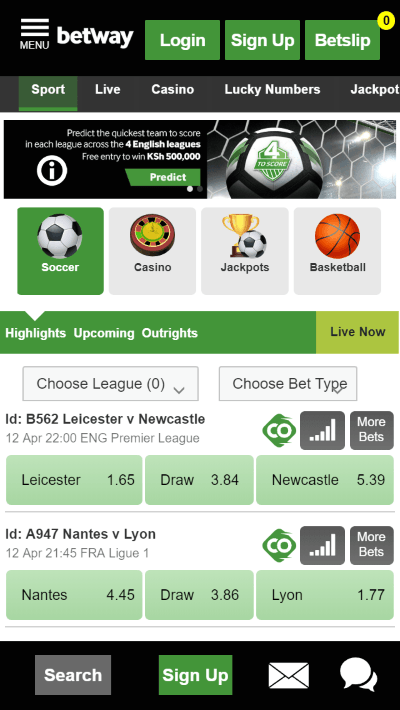 Android users can download the app from the Betway Kenya site only. Full details on how to get it are displayed on the website in the Frequently Asked Questions (FAQ) section. The app has a user-friendly design and quick loading times. It doesn’t take up a lot of memory and it loads with minimum data usage. Easy to use, the app gives you a full selection of Betway Kenya Kenya markets, both local and international. It supports a multitude of betting types, from handicaps, total and over/under bets to various special bets like top scorer, halftime scores, the number of corners or yellow cards. If you’d like to make a deposit to your account, go to the “My Account” page and click on “Deposit funds”. Choose how you’d like to make a deposit and follow the instructions. Betway Kenya Kenya is one of the few online betting sites which lets you wager in your native currency and in the case of Kenya in Kenyan shillings (KSH). Depositing money to your Betway Kenya account is easy through the PayBill option. PayBill is a Safaricom service which lets you pay for services without effort including making deposits to online betting sites. Before using PayBill you must have M-PESA installed on your phone. Once you do, placing a deposit is easy through the Betway Kenya PayBill reference 880185. After only a few steps and security checks you can have your money in your Betway Kenya account balance and ready to wager. The minimum deposit amount is 10 KSH. 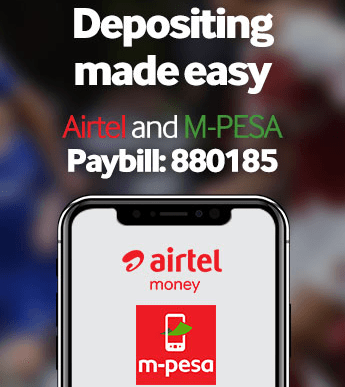 The other deposit option is through the Airtel Payments bank and their Airtel Money app. It also supports the PayBill option and the procedure for depositing is virtually identical. Now you have all information necessary to sign up, deposit and bet with Betway Kenya you need the hottest football tips. That's where we come in: On our homepage you will find 6 highlighted football predictions of that week, in case you are looking for Champions League predictions or any other league you can find them by navigating through our menu. Are you interested in football games that will be played today? Visit our today's football predictions page to start right away! In 2019 we started with the first free WhatsApp football tips service. The first version was launched exclusively for our Kenyan visitors. Don't wait to sign up and receive football tips, predictions and match previews right on your smartphone! Start winning big with FootballPredictions.com!